Garmin first introduced the Vivosmart in 2014 as a lifestyle activity band with extra benefits of smartphone notifications to your wrist. 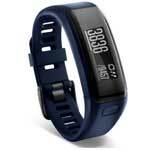 Now Garmin have unveiled the Vivosmart HR, a wearable with added heart rate functionality and features. How do the two compare? The HR in the new Vivosmart stands for Heart Rate and is perhaps the biggest improvement between the two releases. That’s not to say the original Vivosmart couldn’t take your pulse; as it could wirelessly connect to a chest strap to record your beats per minute if you wanted to. For a lifestyle activity tracker though this method was impractical. The Vivosmart HR takes the pulse reading straight from the wrist, meaning you can comfortably monitor your heart rate throughout day and night. Unlike your standard Garmin running or cycling watch which will only monitor during exercise, the Vivosmart HR records this data 24/7, giving you a greater understanding of your heart rate away from the gym. It’s a great indicator of health; as you get fitter your resting beats per minute will lower. Heart rate may even give clues for when you’re feeling a little off as a resting pulse that’s higher could be the result of a cold or virus. Applying the heart rate data to your activity tracking allows Garmin to calculate calories with greater accuracy. The Vivosmart HR gets context around just how intense those last 100 steps were for you. That’s great news if you track your activity with goals around weight loss. Two new metrics which aren’t present on the Vivosmart 1. Intensity minutes records how long you’re active for during the day, whereas active calories calculates how much extra you’ve done above your resting metabolic rate. Not all steps are created equal, especially when you’ve got to ascend up 10 flights of stairs. The Vivosmart HR has it covered and will work out to the best of its ability how floors you’ve climbed using it’s internal barometric altimeter. It sounds technical but in essence it should make choosing the stairs over the elevator a little more rewarding. Garmin are starting to roll out built in heart rate monitors into their Forerunner range with releases like the FR 225 and 235, so if you own an older watch, this feature may have it’s uses. 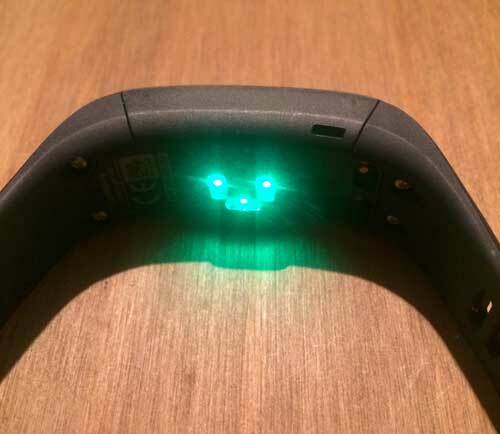 The design is very different to the original Vivosmart which was more like a wristband shape. If you’re familiar with Garmin’s Vivo series, you could easily mistake this design as the successor to the Vivofit 2 rather than the Vivosmart. 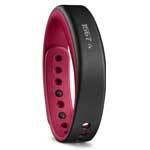 Unlike the Vivofit 2 though, the Vivosmart HR can’t be popped out and onto another colour strap. Both wearables can be controlled by the touching the icons, though the Vivosmart HR has an additional button which can be used to start recording physical activity. The beady eyed amongst you may also spot that the Vivosmart HR uses a watch buckle instead of popping “pegs through holes’. 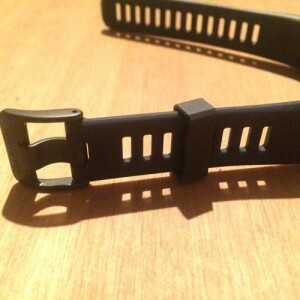 This should help the newer Vivosmart to be more secure on your wrist and less likely to fall off. It’s no surprise really that extra tracking features such as heart rate monitoring, have an impact on how long the juice lasts. Garmin state you’ll get up to 7 days on the original Vivosmart and up to 5 days on the Vivosmart HR. To recharge either device just plug it into a USB port. Looking at how thin the Vivosmart is, I’m amazed it can get 7 days charge. The above covered the major differences between Vivosmart and Vivosmart HR, but there are many similarities between the two. Here’s a quick summary of what they have in common. Either wearable can tell you the time and date. They both count steps and calculate distance off these steps. Pretty simple stuff. A nice touch to Garmin’s Vivo series is that the daily step target is calculated based on your previous days activity. As you increase your steps the goal increases, go lazy for a few days and you’ll see it decrease. It’s a great way to ensure you get a personalised goal relative to your lifestyle. Sit around for too long, and you’ll get told by your Vivosmart to get on the move. It’s a useful reminder, and only takes a few minutes of walking around for the alert to reset and dismiss. Use a compatible smartphone on Android or iPhone and you’ll be able to wirelessly sync your data over Bluetooth to your profile on the Garmin Connect app. From here you can review recent or past activity and compete against your friends on leaderboards. Either wearable can be connected to a Garmin Virb camera wirelessly and used as a remote control to record and stop the footage collected. Quite useful if you’re camera is out of immediate reach like on a helmet. If you’ve misplaced your phone in the house, you can use your connected Vivosmart to make it loud and help you find it. Automatic sleep tracking such as hours slept and how much deep sleep you had. Both Vivosmarts are waterproof to 5 ATM, meaning you can shower or swim whilst wearing it. It may be unsuitable for high-speed watersports or scuba diving, but should be fine for most other things. So there’s a round up of how the Vivosmart series has evolved from 1st to 2nd generation. The inclusion of heart rate tracking from the wrist is a welcome feature to add context around the intensity of your workouts. If you’re a gym goer who doesn’t do endurance exercise for other than warm ups, this wearable could be a great choice for tracking circuit training or weights.